I don’t envy the decisions Terry Francona has to make in assembling the Cleveland Indians‘ Opening Day lineup. Well, let me clarify. He has his handful of easy calls (Francisco Lindor at shortstop, Edwin Encarnacion at first). However, the conundrum he’s facing at second and third base is going to be a tricky one to solve. Everyday second baseman Jason Kipnis is out for a few more weeks with a bum shoulder. While the initial plan might have been to have utility man Michael Martinez hold down the fort a couple games until Kipnis was healthy, his extended time on the shelf should nix this idea. While moving Jose Ramirez over to second is now the best plan, such a move still leaves a hole at third. This is where Francona’s task becomes difficult. He has a solid fielder in Giovanny Urshela who could easily slide in to the lineup and provide a sure-handed glove at third. That said, the young Colombian underwhelmed at the plate when called up in 2015. The only other option would be prospect Yandy Diaz. When it comes to the Cuban slugger, there’s plenty of reason to keep him in the minors, but also more than enough evidence he’s ready for the big leagues. It’s up to Francona to decide which route to take, and it’s a decision which won’t be easy. If you’re looking for an explanation as to why Diaz needs to be called up to the big leagues, look no further than home plate. Despite dealing with a small groin injury, he’s been an offensive monster through Spring Training. As of yesterday, he was hitting an impressive .417 with an OPS of 1.173. In his most recent start, he went 2-for-3 with four RBIs and a home run. All in all, Diaz’s offense has made it impossible to ignore him this spring. Terry Pluto of the Cleveland Plain Dealer has gone so far as to compare his plate discipline to former Indian Victor Martinez, which is quite a compliment. One would think Diaz’s hot bat would make Francona’s call an easy one – Ramirez at second, Diaz at third. Thanks to the latter’s fielding issues, it’s unfortunately not that easy. Knowing they need to get third base figured out, the Indians have been trying to play Diaz there to see if he’s indeed a viable option. However, he’s been doing anything but assuring the team lately. Diaz looked sloppy at third on Monday, booting a grounder for an error and almost crashing into left fielder Michael Brantley on a pop-up. Even when he successfully fielded a grounder, his throw to first had to be dug out of the dirt. So, in Diaz the Indians have a player who could be a terror at the plate, and even more fear-inducing in the field, albeit for different reasons. What Francona and crew have to decide is if one piece of his game outweighs the other. 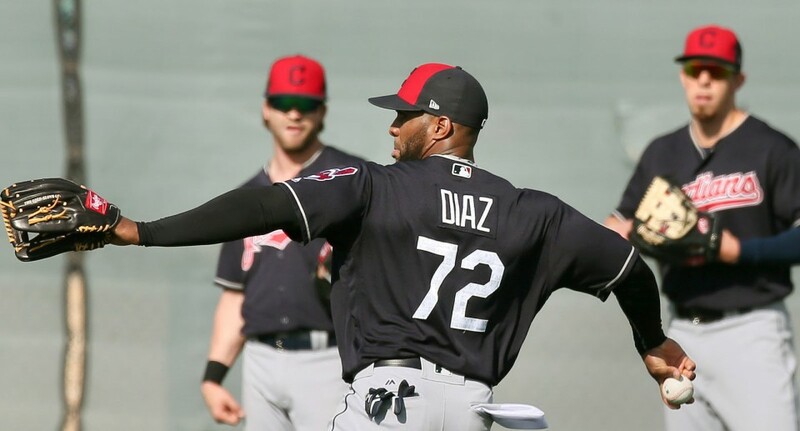 Is Diaz’s next-level performance at the plate enough to allow Cleveland to overlook his room to grow at defense? Are the struggles he’s been showing at third enough to force the Indians to keep him in the minors despite his offensive abilities? At the moment, the belief is Diaz won’t make the Opening Day roster. Though his hitting is turning heads, the team isn’t in a place of desperation. Additionally, once Kipnis is healthy, Ramirez goes back to third and Diaz starts getting less playing time. Despite his looking ready to be a big league hitter, it’s better to have him getting consistent playing time which would only be available in the minors. That said, if he keeps hitting up a storm, the Indians may be forced to reconsider. Remember, outfielder Tyler Naquin wasn’t expected to make the Opening Day roster last season, but an impressive spring forced Cleveland’s hand. Who’s to say Diaz can’t do the same this year?